Dutch band Kleintje Pils perform during the speed skating competition warm up on day 3 of the Vancouver 2010 Winter Olympics at Richmond Olympic Oval on February 14, 2010 in Vancouver, Canada. The Dutch brass band that always performs at Olympic speed skating ovals is considering playing a popular gay song - "Y.M.C.A." - at the Sochi Winter Olympics to show its support for gay rights. 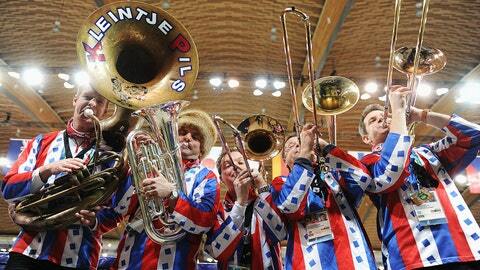 It remains to be seen how Russian and Olympic authorities would react should the Kleintje Pils band play a song widely considered to be a gay anthem. A ban on information about "nontraditional sexual relations" signed into law by Russian President Vladimir Putin has provoked widespread international outrage from critics who believe it discriminates against gays. Band leader Ruud Bakker told The Associated Press on Tuesday that Kleintje Pils could mix the Village People’s "Y.M.C.A." in its sing-along repertoire as "a signal." But he added that the band didn’t want to antagonize organizers or turn its performances into a "political game." "We will see if we can get one or two songs into the selection, knowing that in the Netherlands it will be seen as a signal we are thinking of them (gays)," Bakker said. The band, which keeps speed skating crowds rocking during ice resurfacing breaks at Olympic competitions, is best known for its stirring rendition of Neil Diamond’s "Sweet Caroline" and Queen’s "We are the Champions." Usually they get the thousands of fans of all nationalities to dance along as they walk around the big oval with the permission of organizers. Mixing in a political message would be a new move. The band performed "Y.M.C.A." at the 2002 Salt Lake City games but has not played it since then. It has also practiced some Russian songs for the Sochi Olympics, which run Feb. 7-23. Indirect moves by athletes to show support for gays have already caused controversy in Russia. At last August’s world athletics championships in Moscow, Swedish high jumper Emma Green Tregaro sported rainbow colors on her nails. In the final, however, Green Tregaro went with red nails after track officials said her earlier gesture might violate the meet’s code of conduct. Check out the band performing at the Vancouver Olympics is 2010.